What on earth would make this Stratocaster clone worth well over a million dollars? 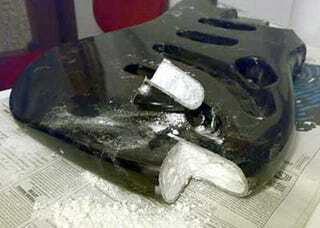 As you can see in the pic above, the electric guitar was stuffed with lots of cocaine, that's what. We former musicians are well aware that the gigsters always have the best blow, but this guitar player went overboard when he decided to fly from Costa Rica to Rome with his drastically modified Squier ax in tow. Too bad The Man noticed a bit of telltale powdery residue poking out of a conspicuous spot on this git-box. We have another pic of the guitar before it was dismantled, looking perfectly innocent.